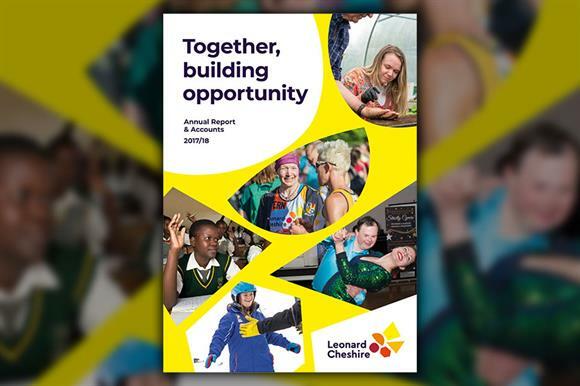 The disability charity Leonard Cheshire saw its income increase by almost £15m in 2017/18, its latest accounts show. The charity’s accounts for the year to 31 March 2018, filed with Companies House this week, show income of £175.9m, up from £161.3m the previous year. The main reason for this was a "significant donation" of an unspecified amount from a benefactor who wanted to remain anonymous. A spokesman for Leonard Cheshire said that the charity could not reveal the value of the donation because of the conditions involved. The amount in donations and legacies received by the charity rose from £10.9m to £25.1m, the accounts show, with legacies accounting for £21.4m of the 2017/18 total, up from £7.2m last year. Donations rose slightly to £3.8m. The charity’s expenditure went up from £160.6m to £171.5m, according to the accounts. It spent more than £1m on termination payments in the year, the accounts say, which related to 172 redundancies, according to the spokesman. He said this was due to the closure of the charity’s homes in Hovenden and Stonecroft, Lincolnshire, due to local circumstances, such as recruitment difficulties and building costs. The charity also withdrew from a number of care homes, which also accounted for some redundancies, the spokesman said. Staff numbers fell from 6,410 to 6,094, the accounts say. The charity has set aside £3.1m for back pay for sleep-in carers, according to the accounts, depending on the outcome of a legal challenge to attempt to increase sleep-in carers’ pay to minimum wage level, rather than a flat fee. The charity is a member of the Social Care Compliance Scheme, an HM Revenue & Customs scheme to help charities repay any outstanding back pay owed to carers. The charity spent £7m on increasing social care staff salaries, which the accounts say are now "well above the national living wage and average rates being paid within the sector". Neil Heslop, chief executive of Leonard Cheshire, told Third Sector earlier this year that one of the first major strategic moves he made after joining the charity in 2016 was to increase the salaries received by staff in social care roles. "We are very committed to being a long-term, high-quality social care provider," he said. "We are going to be able to do that only if our quality is fantastic everywhere and we are going to be able to do that only if we pay people well."